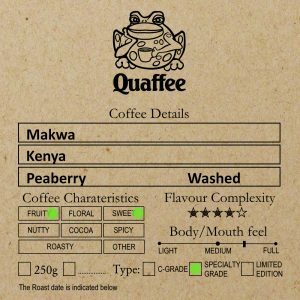 Frog Quaffer felt at home on Valentines day, not because he had a valentine but because we were treated to people passionate about coffe, and especially the art of espresso. Of the 9 places we visited in different areas of the Seattle we where able to have different styles of roast and espresso. We will post pictures, of each place later, and discuss each one. But this post is about the passion. Almost everywhere we went people we spoke to lived the beliefs they where convinced that what they were doing was the best the could. Tracability and transparance where words we heard over and over again. More and more coffee lovers want to share information about where the great coffees they are drinking come from. There is still this old world (or what they call second wave) trend to speak about coffees from a country, not even mentioning their region of the country they are from, but when asked they can drill down to regional, or even farm information. Also in Seattle, which is the USA’s 18th largest city, but the largest city where espresso machines are sold, they have re-invented the espresso machine. Synesso, machines are local. Their innovation is to control two very important items of the espresso brew, the temperature and the pressure. The people we spoke to prebrewed the espresso shot at 4 bar, then extracted at 9 bar. The result is a fuller tasting extraction. Frog Quaffer was blown away by these espressos, chalking up one reason it would be worth to visit Seattle again. We also saw that the trend towards a roast profile that kept the flavours intact wherever we went, there were still a few old schoolers that insisted that with out roaster imported darkening of the bean you could not get full flavour. But this trend is on that like old school is becoming a thing of the past. All in all we felt at home surround by people as passionate about coffee as we are.